Preview: Click to read the story. My Create-A-Book Publishing is on Facebook! Click the "Like" button to be up to date on special promotions! Join a teddy bear on a magical journey through Teddy Bear Land. Play games and meet pink marshmallow bunnies. Enter your personalization information below.Please use proper case and punctuation. Do not use ALL capital letters. We will not be responsible for errors if you do. Double check your information carefully to avoid errors in your book. Note: Story shown here may not be exact. Todd Gregan, age 3, lived in Washington, DC. Todd liked playing with his best friend, Teddy Bear. Mom, Dad and Betty knew how much Todd loved Teddy Bear. One day, while walking in the park, Todd and Teddy Bear came upon a giant hollow tree. 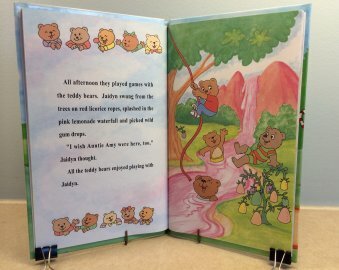 Before Todd knew what was happening, Teddy Bear had lifted him into the opening of the tree. Todd felt himself twisting and turning down the hollow tree. “What's going on? I'm scared!” yelled Todd. “Don't worry. We are together,” said Teddy Bear as he reached out and held his hand. Todd was surprised. It is not dark and scary at all. Everything was light and sparkling, just like fireworks. They tumbled through the cotton candy clouds and down a rainbow slide. They passed the ice cream sundae mountains and landed in the sugar plum field. “It's beautiful here. Where are we?” asked Todd. “This is Teddy Bear Land! Come on, follow me!” replied Teddy Bear. They skipped down a lemon drop path through the jelly bean park, where bunnies were playing hide-and-seek. After passing the strawberry soda fountain, they came to a beautiful gingerbread castle. A handsome cowboy bear invited them inside. The courtyard was crowded with teddy bears who were all playing different games. Some were riding bicycles and others were roller skating. One bear was swinging so high in a tree that Todd thought he would fly right off the swing. Then Todd and Teddy Bear joined in a game of leap frog. All afternoon they played games with the teddy bears. Todd swung from the trees on red licorice ropes, splashed in the pink lemonade waterfall and picked wild gum drops. “I wish Mom, Dad and Betty were here, too,” Todd thought. All the teddy bears enjoyed playing with Todd. The teddy bears decided to have a grand celebration. At the party, Todd Gregan received a crown and became a royal member of the Teddy Bear Land. The trumpeters played for him, and the jugglers and jesters all performed. “Hooray for Todd! Please stay with us forever,” all the teddy bears pleaded. Todd exclaimed, “Oh yes, I'd love to stay here with you.” But Teddy Bear said, “No, we should be going home.” Todd replied, “You're right. We must return to Washington, DC. 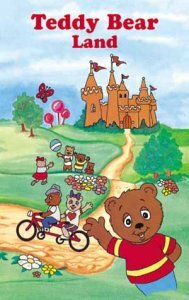 Mom, Dad and Betty will be worried.” So Todd and Teddy Bear waved goodbye to their friends and began the journey home. As they walked outside the castle gates, two pink marshmallow bunnies appeared. “Climb aboard!” the bunny rabbits said. “We will help you go home.” Todd and Teddy Bear gladly accepted the ride and jumped in the cozy saddles. The bunnies hopped their way out of Teddy Bear Land, past the ice cream, sundae mountains and the sugar plum field. Finally they arrived at the biggest tree in the forest. Teddy Bear pointed and said, “This tree leads us home.” Todd waved farewell to the bunny rabbits and thanked them for the wonderful ride. Todd said, “Let's go, Teddy Bear. I can't wait to tell Mom, Dad and Betty about our exciting adventure in Teddy Bear Land.